Rehab and Physical TherapyFor the trainer, physical therapist, or individual working on rehab or recovery from injury, the same exponential resistance curve provides a safe method to work natural movements that will adjust to the needs of the user. 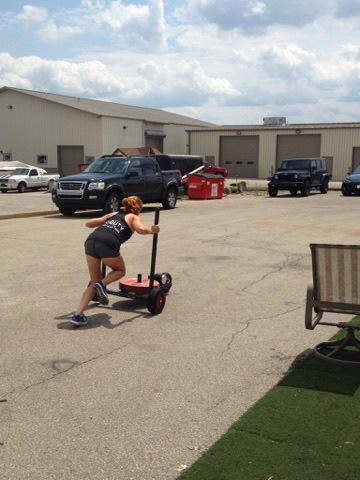 Instead of pushing against a static object such as a wall, or pushing against a traditional sled that can quickly slide away and lead to further injury, the XPO Trainer provides a very low rolling resistance at low speeds with an immediate and automatic increase in resistance that will provide an opportunity for the user to regain equilibrium safely. 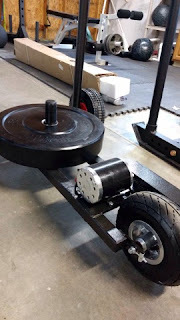 Developed by Bill Strahan, co founder of Armored Fitness Equipment, the "XPO" stands for Exponential Power Output. The XPO Trainer meets force with force, with all the resistance coming from a damper like motor. There is no friction, skidding or tearing up the surface since it is on wheels. Its smooth and quiet. One plate is all you need for some traction, no more loading up a few hundred pounds for a sled workout, or having to constantly change the weights due to variance in athlete What I love about it, is a you fatigue you slow down but you don't grind to a stop. The faster you push it, the harder it gets. The XPO Sled is designed to bolster explosive functional power for any class of athlete from the most elite to your grandmother, on all types of different surfaces. 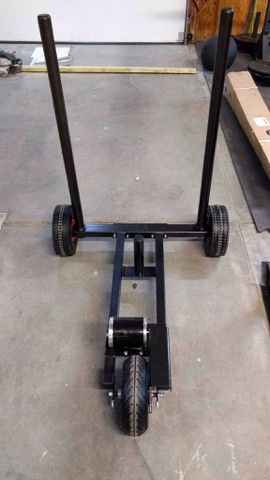 Unlike traditional push sleds and pull sleds that are abrasive on most flooring surfaces,The XPOs durable inflated rubber wheels are easy on indoor surfaces such as carpet and rugged enough for outdoor training on grass, turf, concrete or asphalt and even slightly uneven surfaces. This makes the XPO the perfect training tool for sports performance centers, sports teams, crossfit gyms and even physical therapy clinics! When rehabbing individuals in the therapy setting, implementing sled pushes allows your body to naturally work the core muscles and those of the hips and legs simultaneously without having to instruct someone to do multiple exercises for activation or isolation single muscles. Once an individual is able, this can help save a lot of time and teach more practical applications of muscle engagement. The XPO sled resistance progresses along as the patient recovers increased work capacity, which means no more guessing if the weight is appropriate for their plan of care. 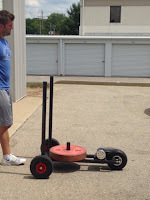 As their capacity to push this sled increases the individual is forced to place their trunk in good position and create appropriate stiffness to continue pushing at force, thus this sled is extremely helpful in reinforcing proper positioning while also being the perfect progressive resistance tool. 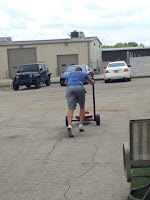 An XPO workout is easy to get into, feels great, and takes less time than existing aerobic and strength exercise to deliver more of the results you desire. A few critiques to justify my rating include price point, and attachments. I know this sled is not the cheapest on the market ($700) but one sled can be used for any number of individuals and serve all their needs equally. Another thing I was a little disappointed in was that it was missing different attachments or hand holds for different pushing or pulling grips. Looking similar to your standard prowler sled I was wishing it had a high and low bars, as well as carabiner loop in the front for sled pulls and drags (or atleast options for such features). However, the standard sled push is what the XPO does best, and is by far my top ranked piece of equipment for the movement. 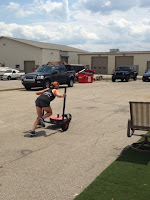 In summary, training advantages I noticed include: safe acceleration/deceleration, full body engagement, convenience for groups, and being surface friendly. Nothing is more functional than feet on the ground training your body in real world, not simulated, athletic movements. Increase speed, acceleration, and explosive power on the surface you play on.